My primary blog these past few years has been Travis McGee & Me, devoted largely to the adventures of that timeless Florida tough guy. One of the great regrets of McGee fans, though, is that the author’s estate is dead set against reviving the franchise. Happily, not all literary estates feel the same way. Tony Hillerman’s Leaphorn and Chee stories were not only page-turning whodunits, but wonderfully written. IMO, they capture the cultural, social, ethical, and religious qualities of the Navajo people wonderfully. They vividly depict the geography, geology, and meteorology of the Four Corners region. I can think of few other mystery series where the environment and landscape are always such key characters. The good news is that the Hillerman estate didn’t like the idea of permanently silencing Lt. Leaphorn, Officer Chee, and Officer Manuelito. 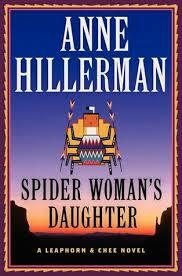 So, Anne Hillerman has taken up the challenge of reviving her father’s franchise with Spider Woman’s Daughter. The novel revolves around the attempted murder of Joe Leaphorn, now retired but consulting with a local museum of Anasazi art. The primary POV is that of Bernie Manuelito, now married to Chee. She is the daughter of Spider Woman, a character out of Navajo mythology. To figure out who shot Leaphorn and why–an assault to which she was the only witness–Bernie needs to dig into the legendary lieutenant’s history and the arcane but passionate field of the study of ancient Anasazi pottery. In the end, she and Chee barely escape with their lives.